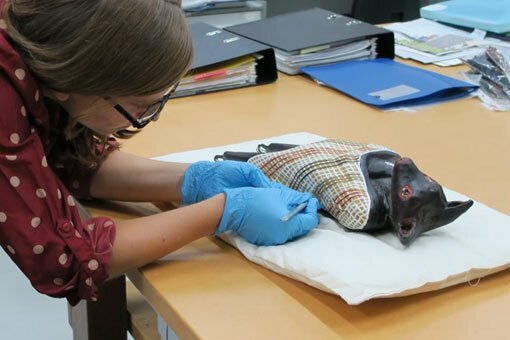 When I started at the Art Gallery of NSW on a fellowship focused on the conservation of modern artworks made of plastic, Lin Onus’s Fruit bats immediately captured my attention. 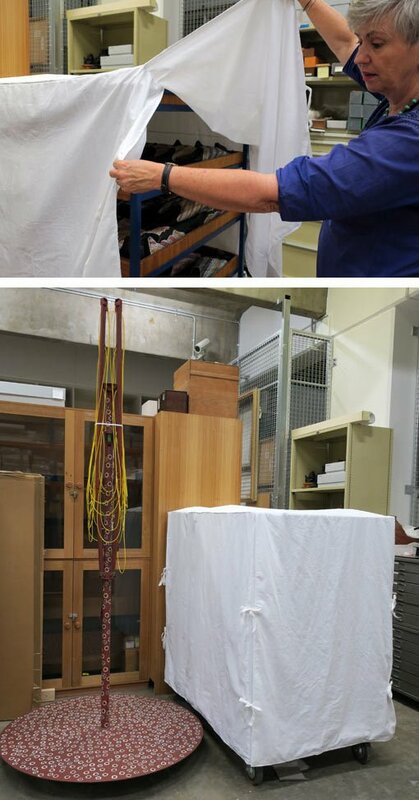 The work has won over many people since its creation in 1991 and it’s easy to see why, with the colourful rarrk or crosshatching that makes each bat unique and the big eyes that stare out at you from the bats’ upside-down position hanging off an Australian icon – the Hills Hoist clothesline. Unfortunately, some of those much-loved bats are now cracking along their sides, revealing a yellow foam interior. 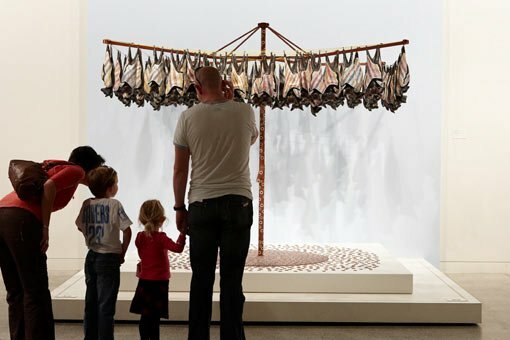 Several years after the artwork was acquired by the Gallery, an interview was conducted with the artist’s son, who helped his father make the bats. He was able to tell us more about the process of creation and to identify the product they used: a polyurethane foam. However, although he could tell us exactly where the foam came from, we still did not know the type of polyurethane it was, because manufacturers do not often release information on the specifics of their products. Different types of polyurethane are made by modifying the chemical formula, resulting in a range of properties and allowing for its use in everything from surfboards and skateboard wheels to cushions and rocket fuel. There are generally two basic starting components that react together to form a polyurethane: an isocyanate and a polyol, of which there are two types – polyester and polyether. Polyesters are rigid and strong because there is a double bond in their chemical structure; polyethers lack this, making for a lighter, more flexible foam. The materials also age differently because different components in the environment are able to attack the weak points in their chemical structures to varying degrees of effectiveness. Water breaks apart esters more readily (in a process known as hydrolysis), whereas ethers are vulnerable to oxidation, particularly in light. So, when it comes to protecting an artwork, our management plan will differ too. For an object we identify as being made of a polyurethane ester, we would aim to minimise changes to the relative humidity of its environment; for a polyurethane ether, we would reduce exposure to light, by displaying it for shorter periods of time at lower levels of light and, in the case of Fruit bats , rotating the position of the individual bats. 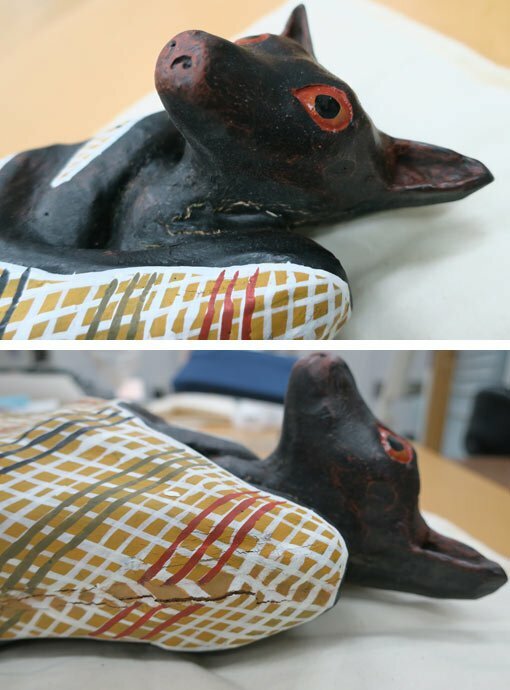 This kind of preventive conservation can go a long way in slowing the decay of artworks. However, for cracks that are already present in Fruit bats , we have to intervene more dramatically, developing mixtures of consolidants to stabilise the structure. This is easier with ethers: because their degradation is mostly on the surface (where light can reach), treatment approaches have been developed that can secure the surface. Esters, however, degrade throughout and we have not yet been able to find a consolidant that works as well on them. So what could we do to save Fruit bats ? To answer this question, we needed to find out from which type of polyurethane it was made. Taking a small sample from one of the bats that was cracking, we used a technique called Fourier transform infrared (FTIR) spectroscopy. 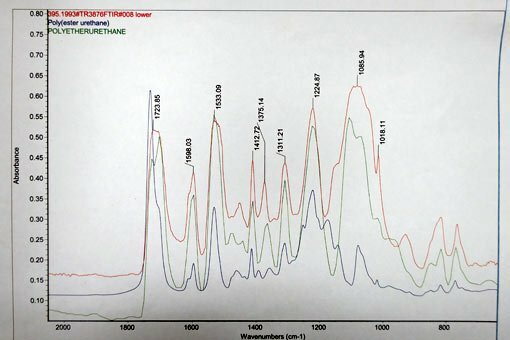 This technique uses an instrument called a FTIR spectrometer to expose samples to infrared energy, which causes the chemical bonds in the molecules of the sample to vibrate. Each type of chemical bond vibrates at a specific frequency. As the different bonds vibrate, the instrument measures how much energy is absorbed at each wavelength and registers the information on a graph or spectrum. By looking at where the peaks are, we can identify the type of bonds in the sample and then, comparing it to data collected from known materials, identify the material as well. Comparing the spectrum of the bat sample to ones in a database, we were able to see that it had peaks that matched a polyurethane ether. This agreed with other visual clues: the foam appeared yellow and crumbling on the surface, but white and compact underneath. The painting of the bats’ exterior had likely provided an extra barrier to oxidation and light and slowed the signs of deterioration, but we still need to manage light exposure to minimise future deterioration, especially as damage from light is cumulative. If we can avoid further cracking, we will not have to use consolidants as soon or as extensively as we might otherwise. A volunteer in our Conservation Department used her sewing skills to make a special storage cover, stitching together layers of Tyvek (a synthetic polyethylene used for everything from disposable coveralls to waterproof maps and wallets), Parsilk (a polyester lining fabric used in clothing) and cotton flannel. While in storage, the bats now hibernate peacefully in their cave, better preserved until the next time they are called upon to charm the public. Kelly’s fellowship has been supported by a grant from the Foundation of the American Institute for Conservation, funded by the Samuel H Kress Foundation.